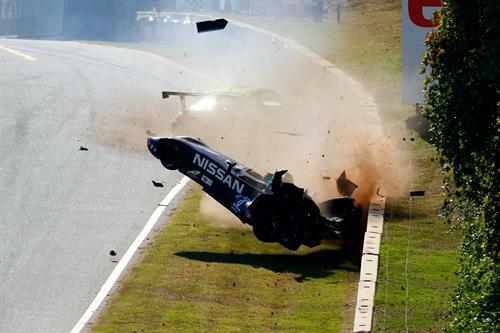 BRASELTON, GA – The 15th Petit Le Mans ran last weekend at the beautiful Road Atlanta circuit in the peach state. The 1,000 mile endurance race is the season finale for the American Le Mans series and the European Le Mans series. 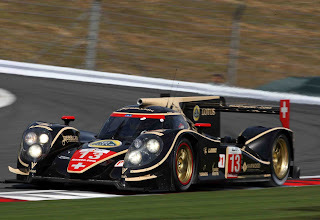 The overall victory went to Rebellion Racing in the P1 Toyota powered Lola B12/60 a full three laps ahead of the nearest competitor. The Lola was piloted by Neel Jani in the final laps with co-drivers Nicholas Prost and Andrea Bellichi. "I think the start was the toughest part of the race, at least for me," Jani said. "It was a big fight with the Muscle Milk car. He was always on my tail, putting a lot of pressure on me... It looked like he took a little bit too much risk, or something went wrong there. From then on, it was just about bringing the car home and not taking too many risks." 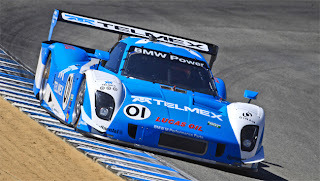 The favored Pickett Racing Muscle Milk entry of Graf/Luhr/Dumas met an unfortunate fate in the first hour of the race. The Green Hornet GTC-class Porsche driven by Peter LeSaffre was exiting the pits when the blindingly fast P1 car driven by Luhr contacted the slower Porsche sending both cars into spins. 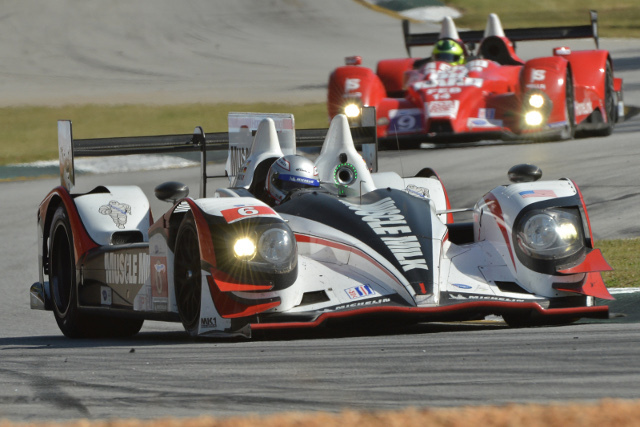 The point leading HPD ARX-03a was sidelined for 65 minutes repairing the damage from the collision. The Muscle Milk car needed to finish 70% of the race to be declared P1 champion, so the pressure was on for the pit crew to get the car together to complete the race. "Until the race was over, I tried not to think about the championship too much," Graf said. 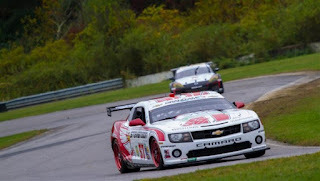 "We won a lot of races this year and certainly deserve it at Muscle Milk Pickett Racing. This is my first championship; I came in second for the last two years, so this is very rewarding for me." 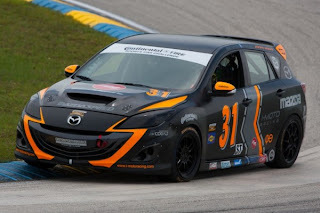 For the race, Pickett Racing ended up 33rd overall and 3rd place in P1. The other podium spots went to Level 5 Motorsports with team owner Scott Tucker driving in both cars... The two P2 entries completed 391 laps with the 95 car of Diaz/Bouchut/Tucker placing second. 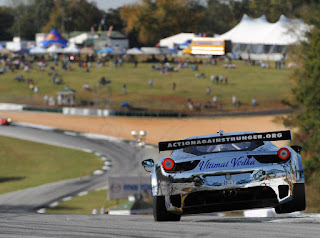 The 055 car of Franchitti/Franchitti/Tucker placed third. Level 5 also won the P2 championship. "We had been through this before with our first PC championship where it came down to the last race," Tucker said. "We knew it was going to be tight this year and Conquest were great competitors. We knew what we had to do. Getting to 70 percent is no easy task. We had to take it easy there... My hats off to my teammates. It's a great day for us." 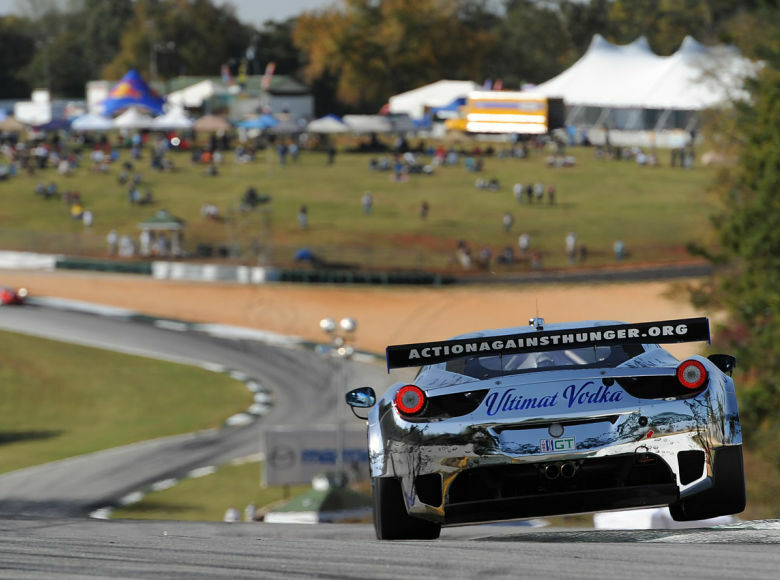 In GT, the mighty Ferrari 458 Italia of Extreme Speed Motorsports and piloted by Vilander/Van Overbeek/Sharp took the class win. 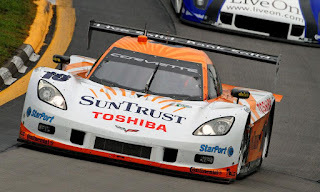 Second place went to the Corvette C6 ZR1 of Taylor/Garcia/Magnussen followed by The BMW entry of Summerton/Auberlein/Muller. The Corvettes spent much of the race running close, but a steering problem in the No 4 Corvette dropped them to a 12th place finish. 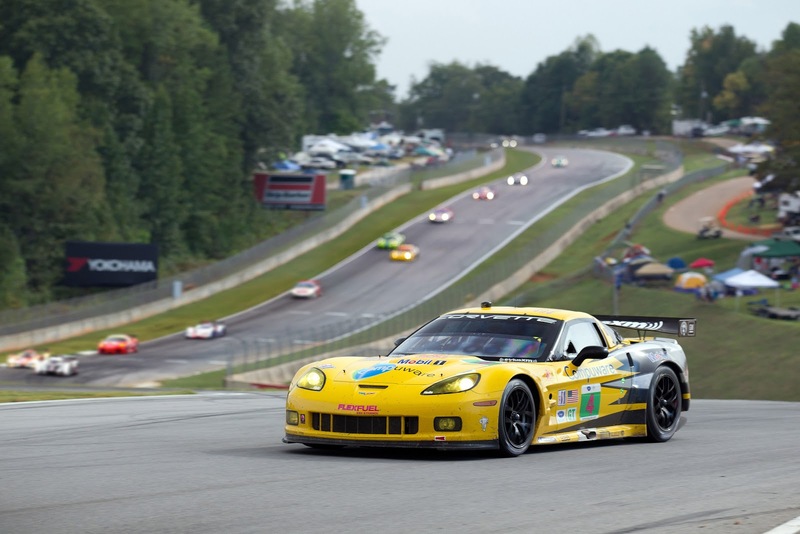 The Corvette Racing team of Milner and Gavin finished top in points in GT. 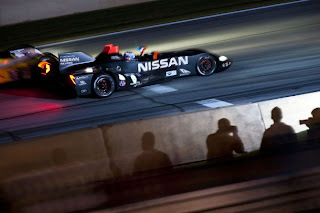 The innovative Nissan Deltawing designed and built by Dan Gurney’s All American Racing and financed by Don Panoz and powered by a turbocharged Nissan 4-cylinder engine ran in its own class and finished 5th overall. It was an impressive accomplishment made even more astonishing by the fact that it suffered a roll-over crash (VIDEO) during practice when a GTC-class Porsche ran into the Deltawing. The car was brilliantly rebuilt and completed the race without a hitch. 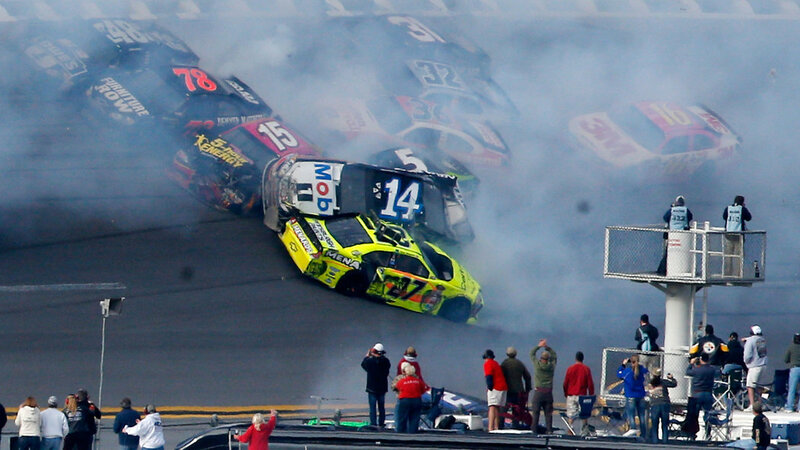 TALLADEGA, AL - Tony Stewart maybe tried a bit too hard to hold the lead on the final lap at Talladega. 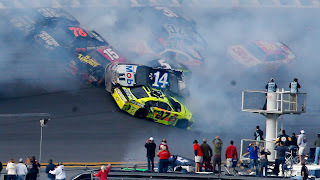 Feeling the pressure with Matt Kenseth passing on the outside and Michael Waltrip benefiting by a push from Rick Mears on the inside, Stewart came down to block Waltrip making contact and causing a 25 car pile-up on the final lap. The wreck took Tony Stewart on a wild ride tumbling atop his fellow competitors. Watching from Clint Bowyers dash cam, Stewart’s car came at him on its side as Bowyer T-boned him. 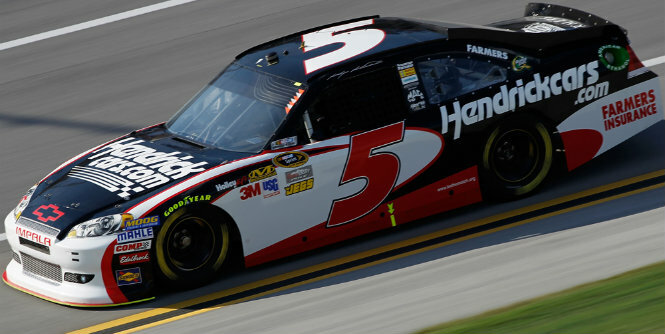 Stewart then spun on its side into Kasey Kahne before landing atop the # 5 car. 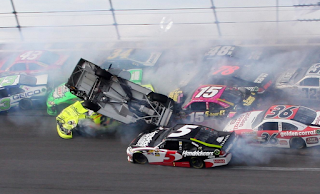 Benefitting from the melee, Matt Kenseth took the lead and was the first car to cross the finish-line and was declared the winner by NASCAR as he was in first place at the time of the accident. "The track kept getting looser for me as the day went on and we never could get it tightened up," said Kenseth. "On the last lap, that's why I chose the middle groove. I knew I couldn't be on the bottom or I'd get spun out, so I had to run the middle or the top to try to make a move. . . . I didn't know what was going happen and I'm still not sure what happened. Somehow, I think Tony got turned and caused a big wreck." Kenseth’s handling problem turned out to be a blessing. Tony Stewart took full responsibility for the accident. "I just screwed up," Stewart said. "I turned down across -- I think it was Michael -- and crashed the whole field. It was my fault, blocking to try to stay where I was at. I take 100 percent of the blame. I was trying to win the race, trying to stay ahead of Matt there, and Michael got a great run on the bottom, had a big head of steam. When I turned down, I turned down across the right-front of his car. It was just a mistake on my part, but it cost a lot of people a bad day because of it." 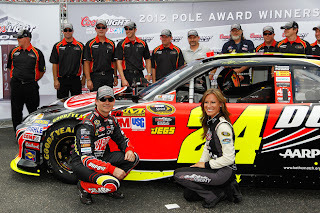 Another beneficiary of the pileup was Jeff Gordon. 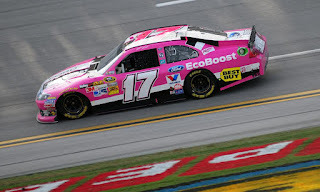 Running in about 13th place, Gordon was able to avoid contact and take second place followed by Kyle Busch. "I don't know how we made it to the white flag," said Gordon. "Coming through that tri- oval, being hit from behind, hitting the guy in front of me, you're sandwiched in between, basically. There are cars doing the same thing on that side of you, cars on that side of them doing the same thing. I really don't know how we made it to the white flag. It was just insane. But you're doing all you can to try to move your lane and hope that you make it back around. In today's case, we did." The first three spots in the Chase remain unchanged with Kieslowski, Johnson, and Hamlin on top. 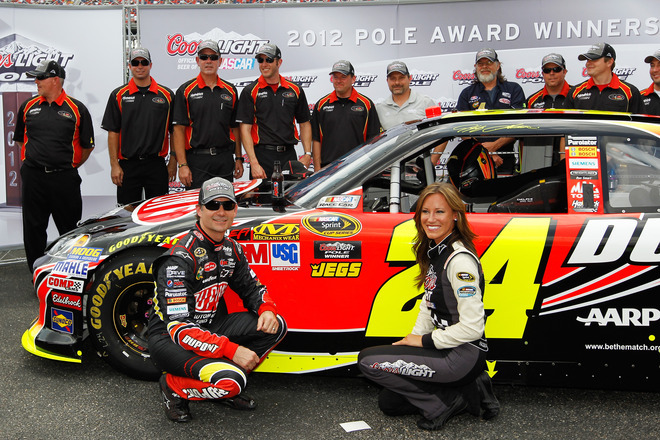 Jeff Gordon benefits the most from Talladega moving up four places to the 6th spot. Stewart loses two spots to 7th, while Dale Jr. suffered the most dropping 4 places to 11th.